…when we are going to Germany to watch the Grand Prix. It is going to be a road trip and anyone that knows me and my obsession with Formula 1 could imagine how excited I am about it. I am now wasting half of my life thinking of ways to meet Sebastian Vettel. Anyway, we are going to make this a road trip round Belgium for a few days and then head to Nurburg. I’ve been preparing myself by sampling a few belgian beers. Last week, I was in a pub up north and, to my surprise, they had a good collection of them. We decided to sample a few and share. But before we did that, we thought we’d get in the mood by having lots of nice Fruli, which I would recommend to anyone who doesn’t like beer. That probably says a lot about it, very fruity and not very beery. But still really yummy. As Alex said, you just expect to find loads of strawberry puree at the bottom of the glass! 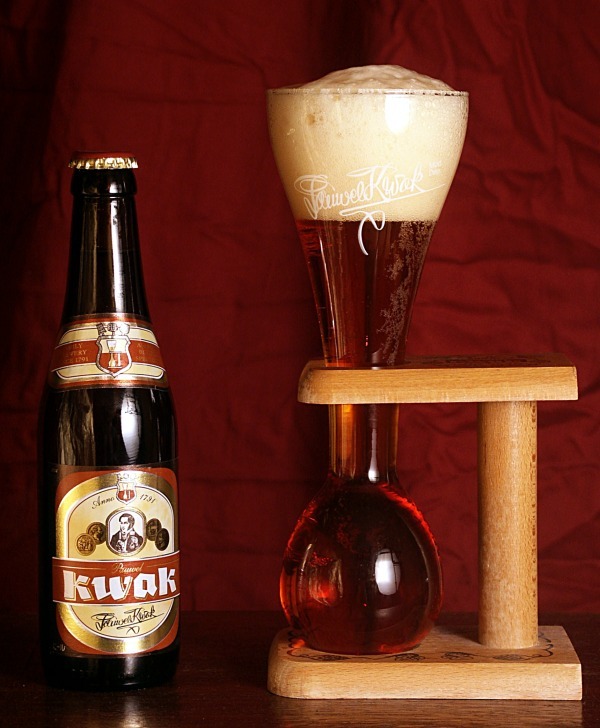 The favourite was Kwak. It was recommended to me by someone I can’t remember a few weeks ago, mainly because of the entertaining glass. We were advised that there is £7 charge if we break it, which kind of made sense when we realised how thin and fragile it was and that it was their only one! It looked good, it was fun to drink (although I was a bit scared about breaking the glass) and it tasted great! It was actually surprisingly smooth and drinkable given the high alcohol percentage (8%). Well, I suppose that is low for a belgian beer, but it did help towards my hangover then next morning. We also tried Rochefort 10, a strong 11.3% trappist beer that I have had before but in that case it just smelled a bit of cleaning products. Not great. When I had it in the past it was dark and bitter, and very very rich. I remember enjoying it, so maybe there was something wrong with that particular one! We had a nice Chimay Blue for a bit of reference really since I knew I was going to enjoy it. Chimay is good, pretty and dark and just a bit bitter. The Delirium Tremens that we had, was ok, although the highlight was probably the entertaining name and the “manly” glass with the pink elephants! It was tasty, but not exciting. I’d rather have a Hoegaarden! Anyway, today I made a strawberry cake and got a sudden craving for strawberry beer. 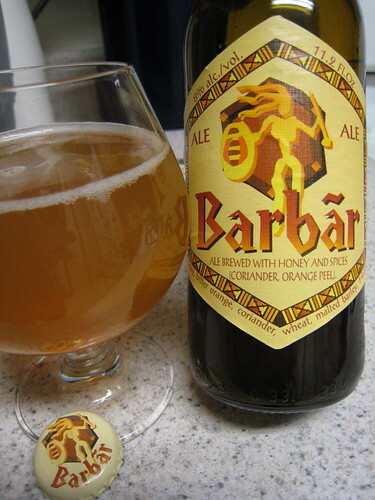 Unfortunately, out local Wine Merchants didn’t have any, so I had to settle for some interesting looking honey beer, called Barbar. The smell is very sweet and you can really tell there is honey in there. Fortunately, the taste isn’t as sweet and it is very smooth. I will be buying that again! Anyway, I might just go back to reading F1 news now. Crazy things happening there nowadays. The beer diary shall continue…..